The University of the Philippines Association of Biology Majors (UP ABM) have put up an event for a cause. 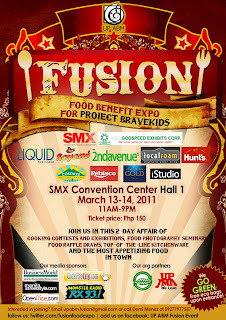 It is entitled "Fusion: A Benefit Food Expo," which aims to raise funds for Project Brave Kids. UP ABM is a recognized organization of UP-Diliman, consisting mainly of Biology majors. They have since decided to reach out and help organizations where they share the same goal, which is giving importance to life! Project Brave Kids is the beneficiary of this said event. A non-profit organization that help improve the lives of kids battling cancer, all the while providing support system not only to these " brave kids" but also to their families. Thanks much to Local Roam for the free entrance for this event, do like them at Facebook and I do suggest you join their mailing list for updates on promos and freebies! We tried and bought Organic Bignay Tea from this stall. also good for my daughter's diabetic condition. Costales Farms, organic fruits and vegetable and hey, organic pork! They welcome people to visit their farm for an invigorating get-away from the urban. They make cupcake towers for special occasions. To sample, I brought home Cookies & Cream cupcake, you'll be surprised how it will look and taste as you make the bite. Topped with cream cheese icing and the Oreo cookie crumb at the bottom! Oh yes! The hot and spicy Shawarma Rice. Crunchy Potato Balls from Krokets! How can this day be more dreamy! @ Ice...Oh definitely! I will try your velvet cupcake, it's my favorite, do expect my text for more cupcake inquiries! Marvin Agustin! He is such a hunk!